The Maker Movement is a global community of inventors, designers, engineers, artists, programmers, hackers, tinkerers, craftsmen, and DIYers. It emphasizes self-directed learning that is informal, self-directed, iterative, and collaborative. Museums and libraries have long been recognized as community leaders in providing engaging, participatory learning experiences. IMLS invests in making by supporting learning spaces in libraries and museums that foster innovation and experimentation through design thinking and project-based learning for people of all ages. 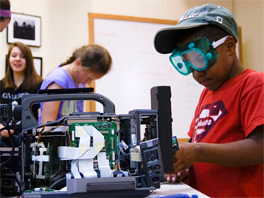 IMLS also funds important work to advance research, promote professional development, and support promising practices for makerspaces and maker programming nationwide. Since 2011, IMLS has invested over $10 million in grants supporting learning through making in museums and libraries. With support from IMLS and the MacArthur Foundation, 24 museums and libraries received grants through the Learning Labs in Libraries and Museums program to create spaces where teens can use digital and traditional media to develop 21st century skills and follow their passions. The lessons learned in these initial pilot sites were captured in the report Learning Labs in Museums and Libraries; momentum continues to grow on the YouMedia online community of practice, managed by the National Writing Project in partnership with the Association of Science-Technology Centers and funding from IMLS. In 2017, IMLS completed a cooperative agreement with the Children’s Museum of Pittsburgh to build and sustain the capacity of libraries and museums to develop effective makerspaces and programs. The project, called Making & Learning, was supported by thought partners from the Exploratorium, the Chicago Public Library, North Carolina State University Libraries and the Maker Education Initiative. The project resulted in a variety of practical resources, including a framework; a publication for practitioners highlighting a collection of case studies that illustrate how making and makerspaces are being implemented around the country; and a suite of tools and other resources intended to enable museum and library professionals to thoughtfully consider key elements of makerspace and program design to support learning and grow staff capacity. Project deliverables were disseminated via conference presentations and a Massive Open Online Course can still be accessed. IMLS helped create and cohost the Capitol Hill Maker Faire in collaboration with the Congressional Maker Caucus in 2015 and 2016 to further educate policymakers and their staff about the Maker Movement. IMLS continues to work closely with Maker collaborators on and off Capitol Hill. The Nebraska Library Commission and the University of Nebraska-Lincoln is advancing economic development in 30 rural communities by developing rotating Innovation Studios and supporting libraries with instructional materials, programming, marketing, and planning for sustainability. The Hands On Children's Museum is creating a Nature Makers program building on its Outdoor Discovery Center and Young Makers program. The interdisciplinary project links nature-based learning with maker activities that use natural materials. Norman Public Schools and its University of Oklahoma library and information science and educational psychology research partners are conducting a three-year design-based participatory action research study that builds knowledge on participatory learning in K-12 school libraries. The New York Hall of Science is developing a set of 21st Century Community Learning Centers provide professional development, making activities, training tools, and a professional community to support Making programs for youth.